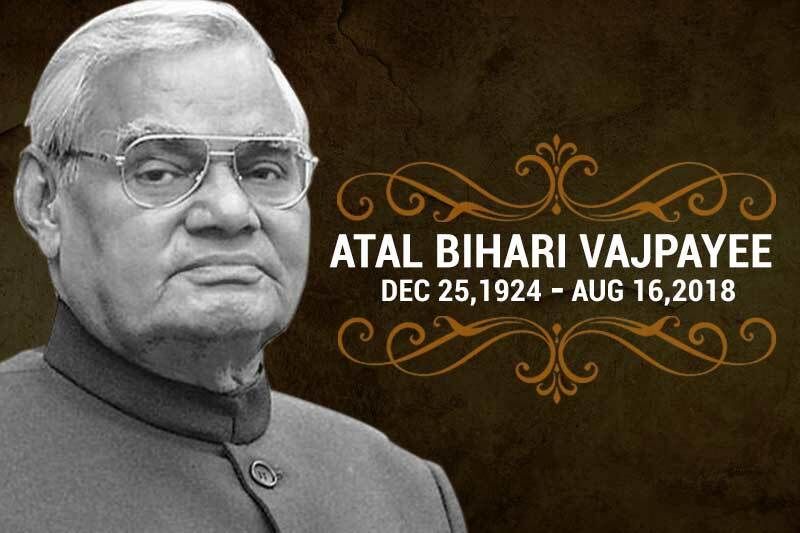 Former Prime minister & BJP stalwart Atal Bihari Vajpayee (93-year) passed away in AIIMS, New Delhi. He served as the Prime Minister of India (BJP-led National Democratic Alliance) three times first (1996 - 13 days), second (1998- 11 months) and then for a full term from 1999 to 2004. He was also the Minister of External Affairs in the cabinet of Prime Minister Morarji Desai. His tenure saw India’s second nuclear test at Pokharan on May 11, 1998. In 2015, He was conferred India's highest civilian honour the 'Bharat Ratna'. Vajpayee's birthday (25 December) is celebrated as Good Governance Day. Vajpayee served the Lok Sabha, the lower house of parliament for 10 terms that began in 1957 from Balrampur (UP) and concluded in 2009. Note: Mr Vajpayee was born to Krishna Devi and Krishna Bihari Vajpayee on 25 December 1924 in Gwalior (Madhya Pradesh). Asian Games gold medallist athlete Hakam Singh (64-years) passed away at a private hospital in Sangrur, Punjab. The Dhyan Chand awardee Mr Singh won gold in 20 km race walk event during the 1978 Asiad at Bangkok. He had also served as Havaldar in the 6th Sikh regiment. US soul singer Aretha Franklin (76-year) passed away at home in Detroit following a cancer battle. Her style on such hits as “Respect” and “Natural Woman” attracted fans all over the world. She was the first female vocalist to be inducted into the Rock & Roll Hall of Fame. Franklin performed at the inaugurations of three US Presidents (Jimmy Carter, Bill Clinton, and Barack Obama). She received the Grammy Award 18 times. Note: The “Queen of Soul” was born in Memphis, Tennessee in 1942. The Chief Minister of Odisha ‘Naveen Patnaik’ has launched Biju Swasthya Kalyan Yojana (BSKY) for 70 lakh families of the state. Mr Patnaik also inaugurated the BSKY Help Desk, released its logo and distributed the BSKY cards to the beneficiaries. The State government went ahead with its own scheme with a coverage of up to Rs. 5 lakh per year per family. The amount is Rs. 7 lakh per family with women members. Note: The BSKY will be implemented with the money of the people of the State for “Healthy Odisha, Happy Odisha" regardless of the cooperation or non-cooperation of anyone. The Bharat Sanchar Nigam Ltd (BSNL) has launched BSNL WINGS a VOIP based service. The WINGS service offers unlimited free audio/video calling for one year, with a one-time fee of Rs 1,297 with GST. Calls can be made using any data connection such as wired broadband, Wi-Fi, 3G or 4G network of any operator. Private life insurer Bharti Axa Life Insurance & Airtel Payments Bank have entered into an alliance to offer Pradhan Mantri Jeevan Jyoti Bima Yojana (PMJJBY) to the latter's customers. The process of purchasing this policy is secure, paperless and completely digital, ensuring convenience for consumers. With this, Airtel Payments Bank also becomes the first payments bank in India to offer the Government of India-backed life insurance scheme. The product (PMJJBY) provided by Bharti Axa Life Insurance offers Rs 2 lakh life insurance cover for a nominal premium of Rs 330 per annum. It can be purchased by all existing or new Airtel Payments Bank savings bank account holders between the ages of 18 to 50 years. The Chief Justice of India Dipak Misra has inaugurated three apps along with Union Law and Justice Minister Ravi Shankar Prasad and Justices Madan B. Lokur & A.M. Khanwilkar. The services provided by the apps include e-filing along with user manual, e-payment options, National Service and Tracking of Electronic Processes (NTSEP). With the launch of e-filing application, convicts and undertrials can directly approach the Supreme Court by filing petitions, documents online from more than 16,000 subordinate courts. Thayong village (Manipur) has organized ten days pineapple festival aimed at encouraging farmers and locals to plant and cultivate pineapples. The festival aims at encouraging farmers and locals to plant and cultivate pineapples. The village produces approximately 20 to 30 tonnes of pineapples every year. This year, the popular Kew variety of the fruit was being sold at 30 odd stalls that were set up at the festival. Senior bureaucrat Ashish Kumar Bhutani (1992 batch IAS officer of Assam-Meghalaya cadre) has been appointed Chief Executive Officer (CEO) of Pradhan Mantri Fasal Bima Yojana (PMFBY). He has been appointed to the post till 9th May 2020. The Pradhan Mantri Fasal Bima Yojana (Prime Minister's Crop Insurance Scheme) was launched by Prime Minister Narendra Modi on 18 February 2016. It envisages a uniform premium of only 2 per cent to be paid by farmers for Kharif crops, and 1.5 per cent for Rabi crops. The premium for annual commercial and horticultural crops will be 5%. Senior diplomat D Bala Venkatesh Varma (Indian Foreign Service officer – 1988 batch) has been appointed as India's next ambassador to Russia. Currently, he is serving as Indian envoy in Spain. The union government also appointed Partha Satpathy (IFS officer-1990 batch) as next Ambassador of India to Ukraine.